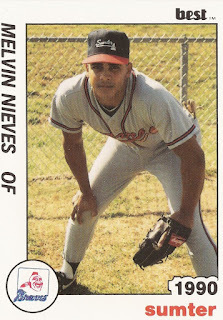 Melvin Nieves didn't have much luck in one April 1997 game batting right-handed, striking out twice with runners in scoring position, The Associated Press wrote. The next night, though, the switch-hitting Nieves came back left-handed and hit a crucial double to help his Tigers to a win, The AP wrote. "It was big for Melvin," Tigers manager Buddy Bell told The AP afterward. "Anytime you get a hit like that in that situation, especially after what happened last night you can give up, but Melvin stuck with it." Nieves was in his sixth season in the majors that year - his third with significant time in the majors. By the time he was done, he had time in seven seasons and 458 major league games. He also played two seasons in Japan and didn't stop playing somewhere until 2008. Nieves' career began in 1988, signed by the Braves as a free agent out of his native Puerto Rico. Nieves started in the rookie Gulf Coast League. He made single-A Sumter in 1990, then AA Greenville in 1992. He also made Atlanta in 1992. Nieves debuted with Atlanta that September. He got into 12 games and got four hits. He then returned to the majors in 1993 and 1994 with the Padres, getting into 19 and 10 games respectively. Nieves got his first significant time in the majors in 1995. He got into 98 games and hit .205. He then moved to the Tigers and got into more than 100 games in each of 1996 and 1997. He hit 24 home runs in 1996 and 20 in 1997. In another April 1997 game, Nieves almost hit another home run, ending up with a bases-clearing double. "I didn't get all of that one," Nieves told The AP afterward of that double. "I think (the center fielder) may have turned the wrong way. It came at a good time. I was hoping it was going to be a grand slam but I'll take it." Nieves moved to the Reds in 1998. He got into 83 games and hit .252. Early that year, Nieves went through personal tragedy, losing his infant son to a heart defect. "This whole situation helped me realize that no matter what happens in baseball - good or bad - my family is going to be there no matter what," Nieves told The AP after his son's passing. "If I lose the game tomorrow, my family is going to be there and we can do something else." Nieves moved to Japan and Daiei for 1999 and 2000. He then returned stateside in 2001. He got brief looks at the Rockies system in 2001 and the Nationals system in 2005. In between, he played in independent ball and in Mexico. His last recorded time was in 2008 at Laguna in Mexico.